Window metallization is a process where metallization is done on a selected area, leaving certain area un-metalized to ensure a clear window in a film. Laminating printed web with a metalized film gives the packaging excellent visual appeal, as the colors appear metallic and shiny. With window metalized, we metalized the film in such a way where certain parts of the film reveal the product inside while still backing the printing inks with metal. The product is displayed in a clear window, and the colors have the brilliance of a metalized bag. Window metallization is the ideal process for creating a package that stands out on the shelf. In today's economy, differentiation is more important than ever, and window metallization will make the product pop out on the shelf. 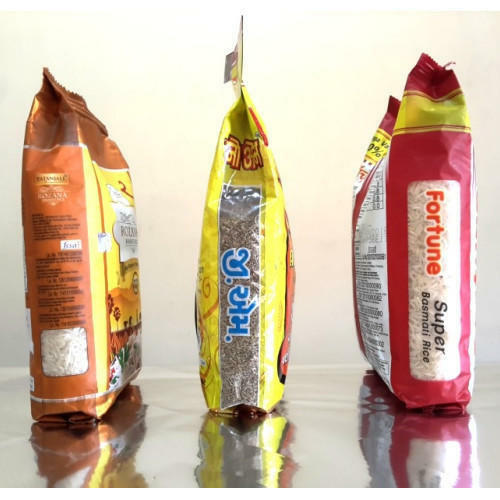 Films to get the window on a certain portion of the films & other portion remains Clear/Transparent so that the consumers can see the product packed inside a pouch.